A section known as "The way of appearance/opinion" (doxa). The poem is a narrative sequence in which the narrator travels "beyond the beaten paths of mortal men" to receive a revelation from an unnamed goddess (generally thought to be Persephone) on the nature of reality. Aletheia, an estimated 90% of which has survived, and doxa, most of which no longer exists, are then presented as the spoken revelation of the goddess without any accompanying narrative. The traditional interpretation of Parmenides' extremely obscure work is that he argued that the every-day perception of reality of the physical world (as described in doxa) is mistaken, and that the reality of the world is 'One Being' (as described in aletheia): an unchanging, ungenerated, indestructible whole. Under 'way of seeming', Parmenides set out a contrasting but more conventional view of the world, thereby becoming an early exponent of the duality of appearance and reality. For him and his pupils the phenomena of movement and change are simply appearances of a static, eternal reality. It is with respect to this religious/mystical context that recent generations of scholars such as Alexander P. Mourelatos, Charles H. Kahn, and the controversial Peter Kingsley have begun to call parts of the traditional, rational logical/philosophical interpretation of Parmenides into question. According to Peter Kingsley Parmenides practiced iatromancy. It has been claimed, for instance, that previous scholars placed too little emphasis on the apocalyptic context in which Parmenides frames his revelation. As a result, traditional interpretations have put Parmenidean philosophy into a more modern, metaphysical context to which it is not necessarily well suited, which has led to misunderstanding of the true meaning and intention of Parmenides' message. The obscurity and fragmentary state of the text, however, renders almost every claim that can be made about Parmenides extremely contentious, and the traditional interpretation has by no means been completely abandoned. For thought and being are the same. It is necessary to speak and to think what is; for being is, but nothing is not. 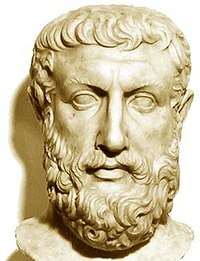 Parmenides claimed that the truth cannot be known through sensory perception. Only pure reason (Logos) will result in the understanding of the truth of the world. This is because the perception of things or appearances (the doxa) is deceptive. We may see, for example, tables being made from wood and destroyed, and speak of birth and demise; this belongs to the superficial world of movement and change. But this genesis-and-destruction, as Parmenides emphasizes, is illusory, because the underlying material of which the table is made will still exist after its destruction. What exists must always exist. And we arrive at the knowledge of this underlying, static, and eternal reality (aletheia) through reasoning, not through sense-perception. For this view, that That Which Is Not exists, can never predominate. You must debar your thought from this way of search, nor let ordinary experience in its variety force you along this way, (namely, that of allowing) the eye, sightless as it is, and the ear, full of sound, and the tongue, to rule; but (you must) judge by means of the Reason (Logos) the much-contested proof which is expounded by me. After the exposition of the arche, i.e. the origin, the necessary part of reality that is understood through reason or logos (that [it] Is) , in the next section, the Way of Appearance/Opinion/Seeming, Parmenides proceeds to explain the structure of the becoming cosmos (which is an illusion, of course) that comes from this origin. The structure of the cosmos is a fundamental binary principle that governs the manifestations of all the particulars: "the aither fire of flame" (8, 56), which is gentle, mild, soft, thin and clear, and self-identical -- this is something like the masculine principle -- and the other is "ignorant night", body thick and heavy -- this is something like the feminine principle. Thus Parmenides' cosmogony is exactly like the yin-yang picture in Chinese cosmogony. Only nineteen fragments of Parmenides' poem have survived into the modern era. All nineteen fragments were transcribed from Greek to German by a German paleographer named Hermann Diels in the 19th century. In fact, Diels assembled a document that entailed most of the known pre-Socratic philosophical writings. One important fragment in Parmenides' poem includes the notion that being is and as such it cannot be divided. Parmenides also teaches that in order to truly exist, one must look beyond appearances. For Parmenides, one way to go beyond the physical world was to meditate. Fragment III of the poem for example entails the idea of thinking and being as one and the same. Graduate students of philosophy have written thousand page dissertations on Fragment III alone. Upon further investigation into Parmenides' poem, one will find the underpinnings of Greek determinism. In other words, fate is the driving force behind the universe and thus free will is a mere figment of the human imagination. In the 19th century, Hegel incorporated this notion of Greek determinism into his philosophy of history. In c.485 BC, Parmenides makes the ontological argument against nothingness, essentially denying the possible existence of a void. In c.460 BC, Leucippus, in opposition to Parmenides' denial of the void, proposes the atomic theory, which supposes that everything in the universe is either atoms or voids; a theory which, according to Aristotle, was stimulated into conception so to purposely contradict Parmenides' argument. In c.350 BC, Aristotle proclaims, in opposition to Leucippus, the dictum horror vacui or “nature abhors a vacuum”. Aristotle reasoned that in a complete vacuum, infinite speed would be possible because motion would encounter no resistance. Since he did not accept the possibility of infinite speed, he decided that a vacuum was equally impossible. ^ See e.g. David Sedley, "Parmenides," in E. Craig (ed. ), Routledge Encyclopedia of Philosophy (Routledge, 1998): "Parmenides marks a watershed in Presocratic philosophy. In the next generation he remained the senior voice of Eleaticism, perceived as champion of the One against the Many. His One was defended by Zeno of Elea and Melissus, while those who wished to vindicate cosmic plurality and change felt obliged to respond to his challenge. Empedocles, Anaxagoras, Leucippus and Democritus framed their theories in terms which conceded as much as possible to his rejections of literal generation and annihilation and of division." Austin, Scott (1986). Parmenides: Being, Bounds and Logic. Yale University Press. Coxon, A. H. (1986). The Fragments of Parmenides. Van Gorcum. Curd, Patricia (1998). The Legacy of Parmenides. Princeton University Press. Gallop David. (1991) Parmenides of Elea – Fragments, University of Toronto Press. Kingsley, Peter (2001). In the Dark Places of Wisdom. Duckwork and Co..
Mourelatos, Alexandar P. D. (1970). The Route of Parmenides. Yale University Press. Extensive bibliographies are available here and here.